Ali Smith told Nicola Sturgeon that the art form could be a 'unifying force' in the face of division. Picture: Lisa Ferguson. Art is needed now more than ever to breach the political divides of Brexit, Ali Smith has told Scotland’s First Minister. The author of the acclaimed Autumn and Winter - two books from a planned quartet of contemporary novels - told Nicola Sturgeon that the art form could be a “unifying force” in the face of division. The two were speaking in conversation at the Edinburgh International Book Festival, where Ms Sturgeon acknowledged that politicians were often the cause of such division. She said: “As a politician I’m acutely aware, and it’s something I think about a lot, that politicians by definition we’re opinionated, we put forward strong views on policies, we’re sometimes the cause or a cause of the division. “Also how we communicate now seems to reinforce those divisions, it pushes people to take sides and simplify things. Ms Smith responded: “The novel is a unifying force. All art reminds us to engage and it reminds us to enter, even just with itself, dialogue. Dialogue is the source of life. Ms Smith said this was “the darkest time that I’ve ever lived in”. She said: “In our lives, across the world from this country outwards, from the UK outwards it’s a dark, dark premise. 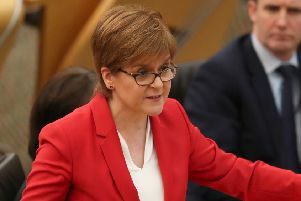 But she told the First Minister, who said most would recognise to some extent the current time as “a dark place, a worrying place” that the novel was ultimately a form that gave hope for the future.